The NavStation is a comfortable and extremely functional space and as you can see from the photograph, there is a lot to explain. The main control panel for all the boat electrics is at "D" with a spin off panel below at "B". On the panel is a Quad Cycle battery meter "I" and an Amp hour Meter "G" giving full visibility and control of all charging and discharging systems on the boat, plus an at a glance look at the level of the battery bank. 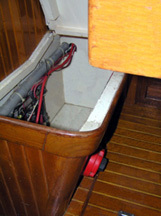 "E" is the main bilge pump switch with "C" being the emergency backup Bilge pump with an audible alarm. "F" are comfortable headphones for the SSB and "H" and "N" are lights. In the cupboard behind the Trimble at "K" are two AC outlets. Trimble Galaxy Inmarsat-C/GPS marine satellite transceiver at "K"
SGC2000 1.6-30MHz SSB Radiotelephone Transceiver at "M"
Kenwood MPV7023 stereo/Mp3 player at "N"
Garmin 76 GPS at "P"
Robertson AP300 autopilot control head at "Q"
Navigation computer (Different model DELL Inspiron 7000 400Mhz included with sale) at "S"
SI-TEX T-170 24nm radar at "T"
Caframo 360 degree rotating 2 speed fan at "U"
Electronic Engine Instruments, battery, temp and oil pressure at "W"
Trace 2500 Watt Inverter/Charger monitor and on/off switch at "X"
Port Locker Below NavStation "A" opens on to three shelves with a surprising amount of storage. 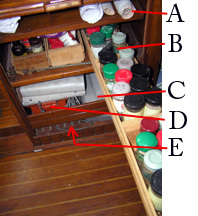 The NavTable itself opens for chart and other storage - "Y"
The front of the NavTable has a rolltop door "Z" behind which there are three deep shelves and behind that the Trace Inverter. Finally there is storage under the NavSeat. The main Positive and Negative Bus-Bars are located here as it is directly above the battery bank. Note Battery Selector Switch in a convenient but out of the way location. Also located here is the Fourwinds wind generator regulator and the SILVA Server. We found this to be the perfect location for Howie's Litter box as there is a small opening behind the battery selector switch. A - Deep Shelf. We use for rolled charts for our current area only, remaining rolled chars we keep in the master cabin stbd lower locker. B - Three long spice jar holders. Previous owner used them for tapes. C - Area in-front of Inverter we use for our Printer, Scanner and CD Burner - These items not included. E - On a shelf just above inverter is where we keep all of our oversized chart books. We have the the East Coast ICW down to the Keys, the Bahamas and the Carribean.